Saint Martin de Porres is the First Black-American Saint Canonized by Pope John XXIII May 16, 1962. The tapestry on the walls of the Cathedral of Our Lady of the Angels Downtown Los Angeles, California reflects the diversity of the Catholic Church and the Faith. St. Benedict the Moor’s Feast day is April 4th, also called St. Benedict the Black, the name Moor is the Italian word for “black”. 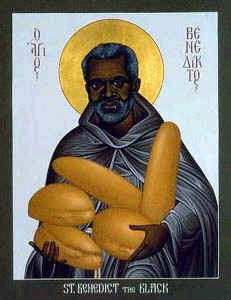 He was a black slave and the Patron Saint for African-Americans. He was born in Italy when freed, he became a superior of a large group of recluses that Pope Pius IV (r. 1559-1565) disbanded. St. Benedict the Moor was illiterate, he entered the Franciscans as a lay brother, his many miracles and holiness brought countless visitors to the monastery and despite his illiteracy, he was named superior of the monastery. St. Benedict the Moor was canonized 1807. Bunson, Matthew, Bunson, Margaret, Bunson, Stephen (1998). Our Sunday Visitor’s Encyclopedia of SAINTS. Huntington, Indiana: Our Sunday Visitor Publishing Division.